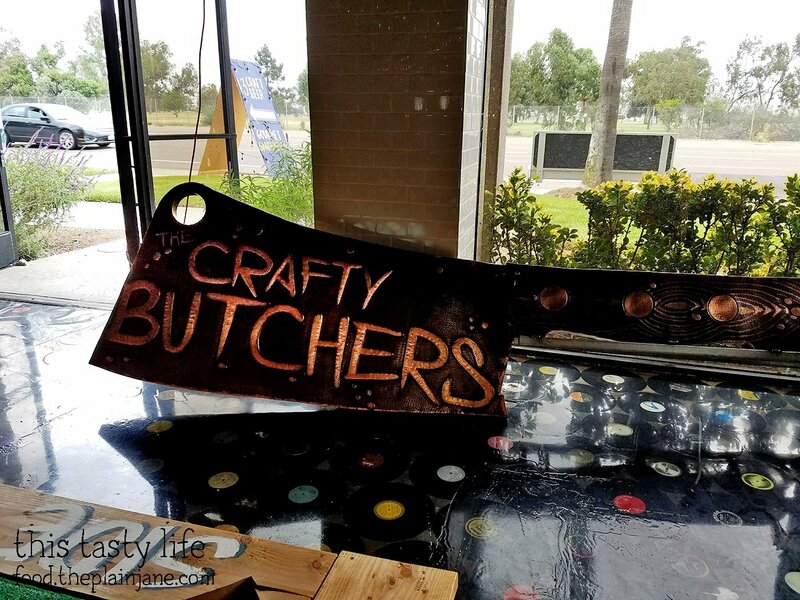 The Crafty Butchers is a new sandwich shop/bar that opened recently in the Miramar area. It’s located next door to the Malted Diner, formerly known as “Capetown”. I’ve gone two times – let’s check out my first visit which was with CC from Pink Candles at Ridgemont High. I actually made the mistake of trying to enter from the back of the restaurant, which faces the street. The entrance faces the parking lot. This is where you can see into the space and there’s a bar up at the front and a little bit inside. 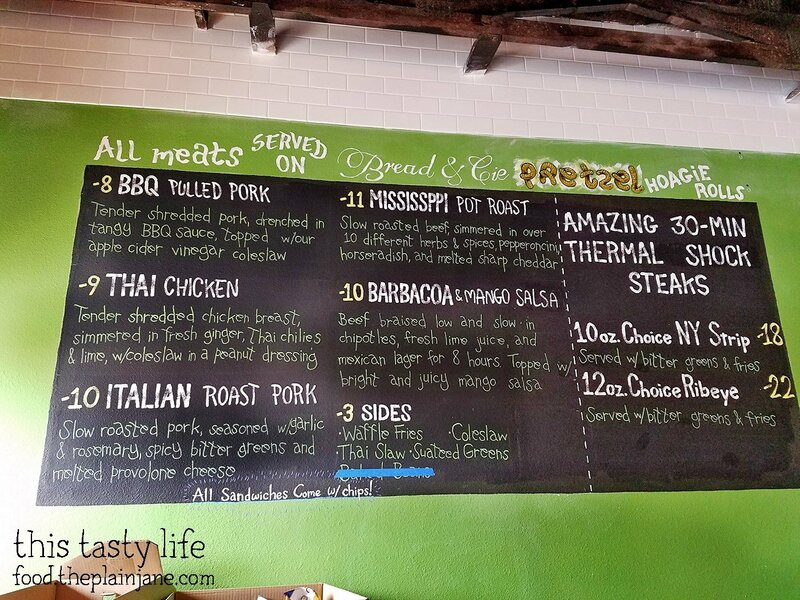 This is the photo I took of the menu on my first visit to the Crafty Butchers. 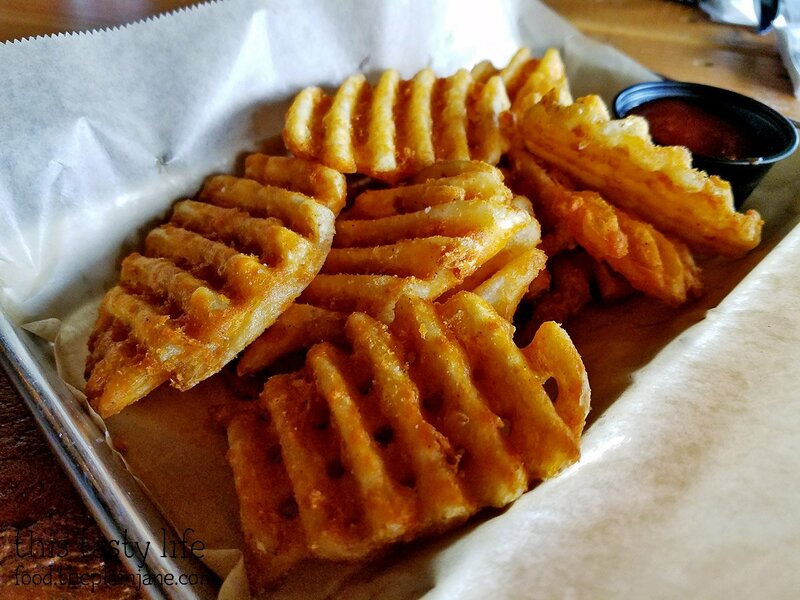 The waffle fries are no longer under the “Sides” and are $4 instead of $3. 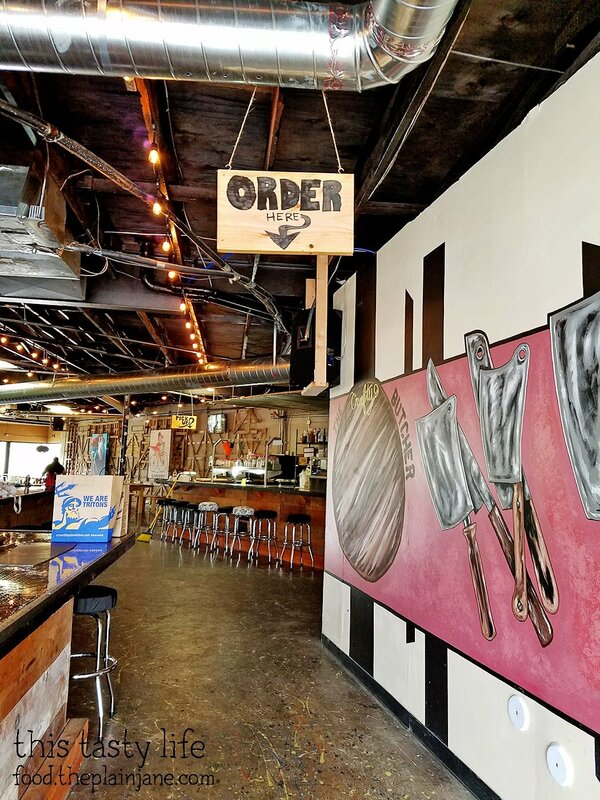 This is a cool hatchet sign for the Crafty Butchers that’s at the back of the restaurant. It’s got a big, wide open feel to it with long picnic tables. 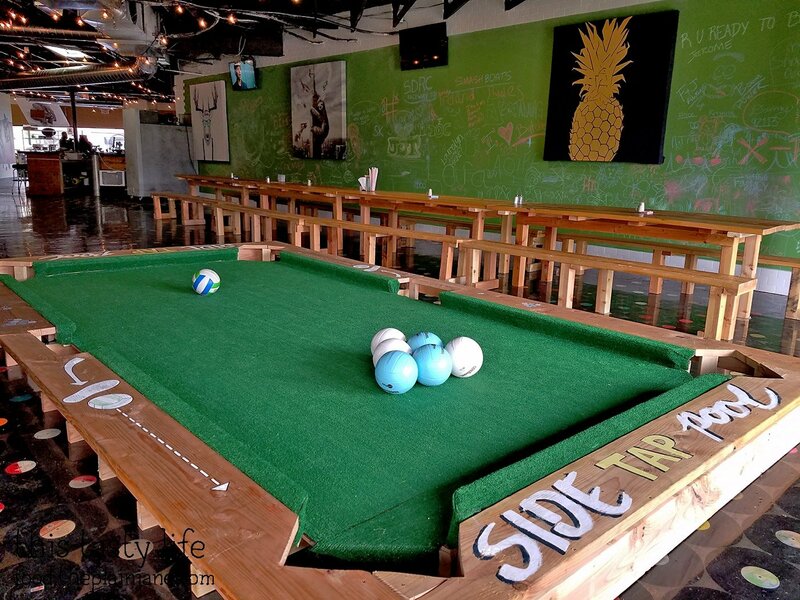 And this crazy soccer-pool hybrid game you can play. And there are dart boards, playing cards, and various board games floating around inside. Great place for a group of friends to hang out! 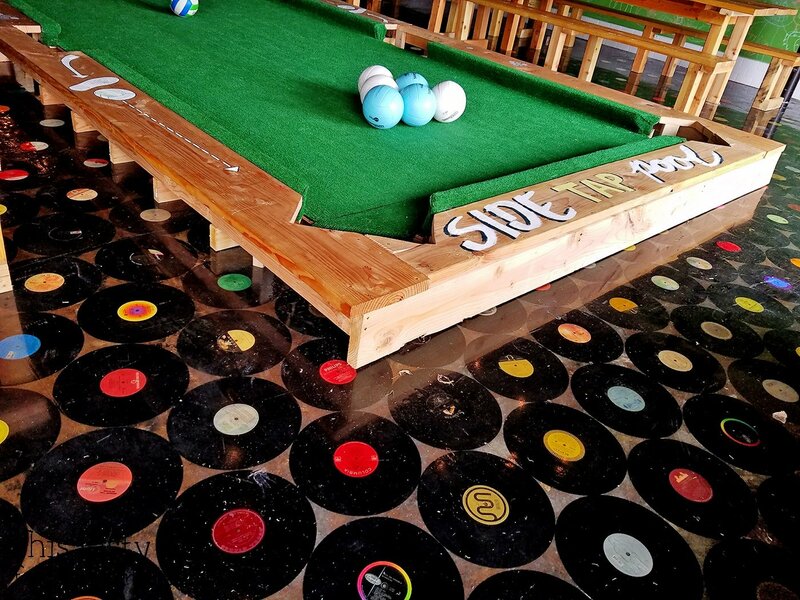 I was also enchanted by the floor that was covered in records. How cool! 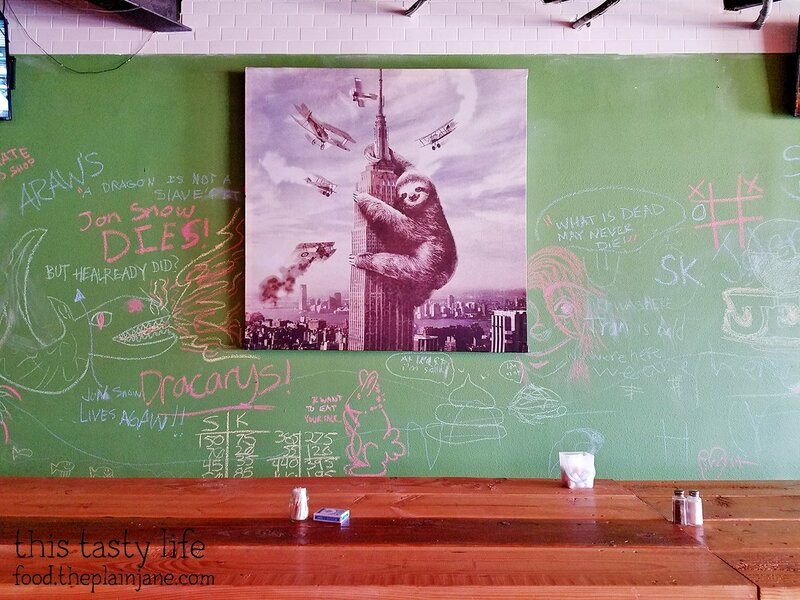 The walls are made with chalkboard paint and there are buckets of chalk around so you can draw on the walls to your heart’s content. I hope there aren’t any spoilers on here. Sorry. 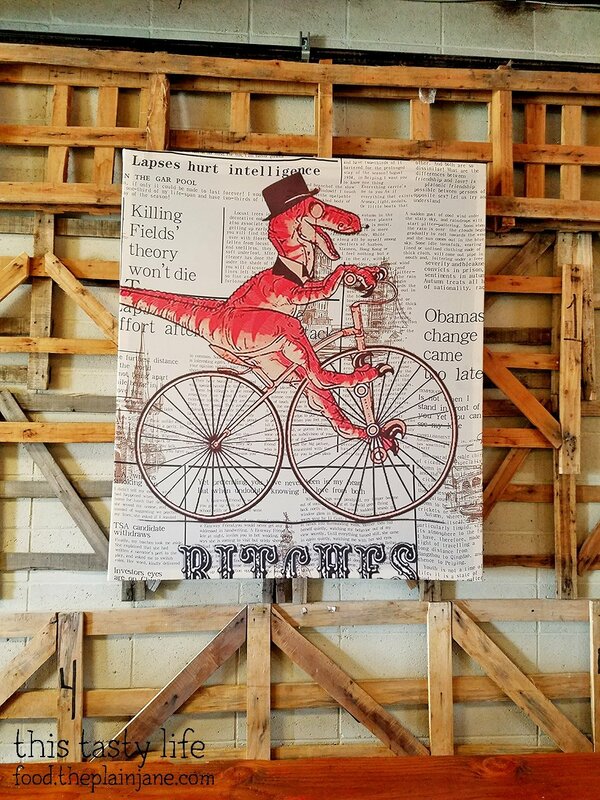 The art also amused me. CC and I had a Groupon for the Crafty Butchers that we shared for the meal. It was two sandwiches and two sides. You also get chips with your sandwich. On my first visit, the waffle fries were considered a side. I learned on my second visit they changed it so you could no longer get fries with the Groupon deal. I ordered the Thai Chicken Sandwich. It comes with a Thai coleslaw on top of chicken. The coleslaw has a wonderful peanut dressing on top. The veggies manage to stay crispy and crunchy. The chicken is very tender and tasted wonderful with the peanut sauced coleslaw. Normally I can’t stand coleslaw but this was a winner in my book. I also loved the warm, crusty pretzel roll the sandwich is served on. It’s a good size for a sandwich and adds a nice texture to the meal. The waffle fries were good. Nothing new or amazing but a nice option to go with a sandwich. 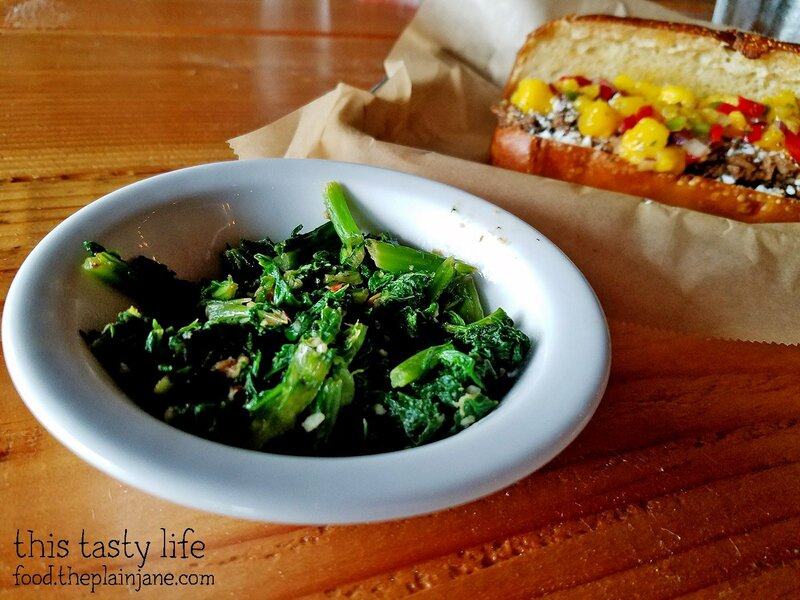 CC had the Barbacoa with Mango Salsa for her sandwich. 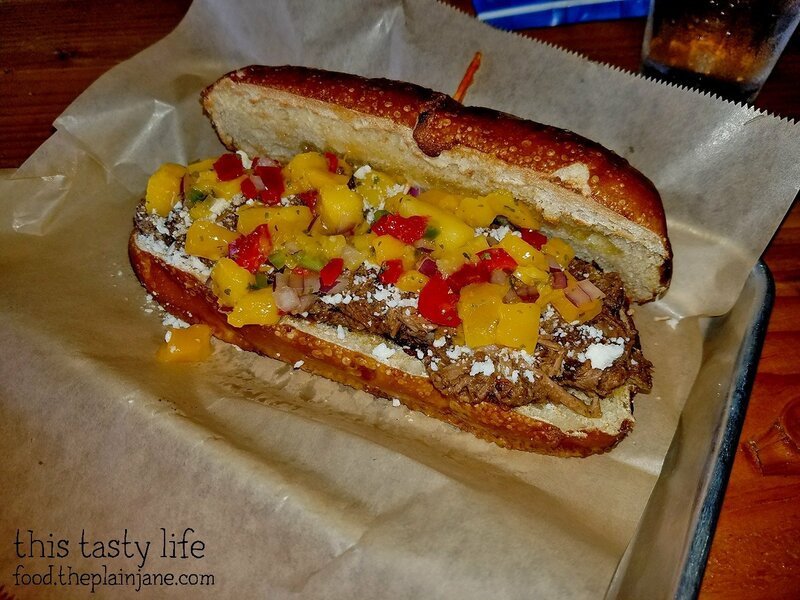 I tried a little bit – the barbacoa was very tender and I liked the sweetness from the mango salsa. Her side was the bitter greens. I’m not personally a fan of these but I tried it. They were…. a bit bitter. Heh. My second visit was with my co-workers on my actual birthday for lunch. I opted for the Italian Roast Pork sandwich with provolone cheese. I asked for no bitter greens since I don’t care for them. The pork was incredibly flavorful – you could definitely taste bits of the herbs used in the roasting of the pork. The cheese was a nice compliment to the pork as well. I’d definitely order this again! My co-workers and I hung around for awhile and one of the workers there came by to offer us a complimentary slice of cheesecake, which we gladly accepted. What a cool gesture! 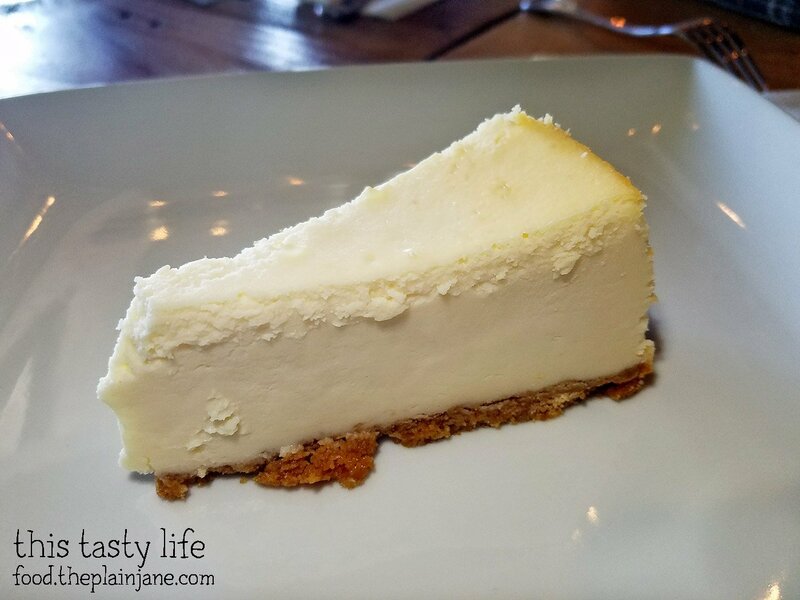 We all shared bites of the creamy cheesecake which was a nice way to end our lunch. The greens were mustard greens which I like. The side portion was kind small though. 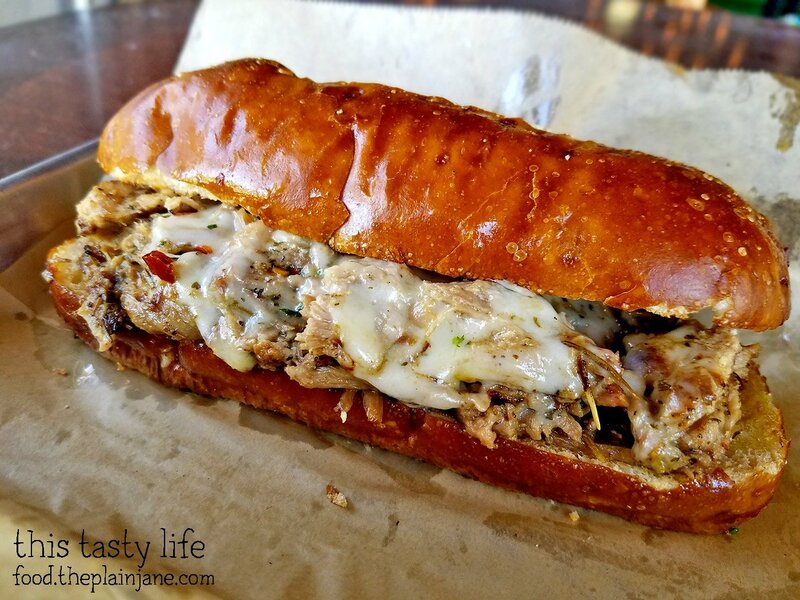 Your pretzel bun was good; my Barbacoa sandwich was also quite tasty. Nice mix of flavors. The space is huuge. It probably gets packed at night. They were really nice! Glad you liked those greens! I’ve seen photos online – it does like like a hip spot at night. 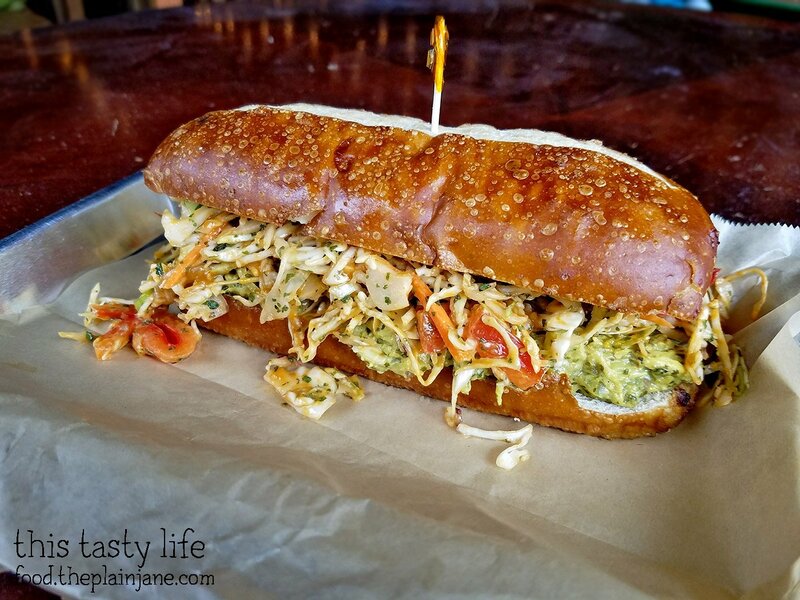 The thai coleslaw and mango salsa sound like delicious compliments to the sandwiches. Very considerate employee to bring out cheesecake! Hi Nicole – they did have some nice toppings for their sandwiches. Yummy flavors! I was surprised by the complimentary cheesecake, it was very nice of them to bring that out. What a fun spot. I’m going to add it to my list of restaurants to visit! 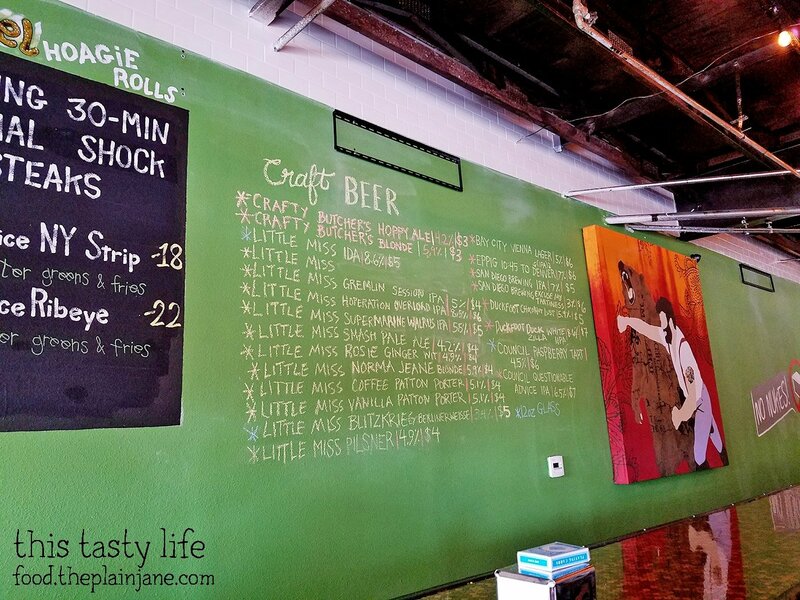 Hi Catalina – It is a fun spot! Hope you get to check it out! The sandwiches look hefty. Do they only offer pretzel roll bread for their sammys? 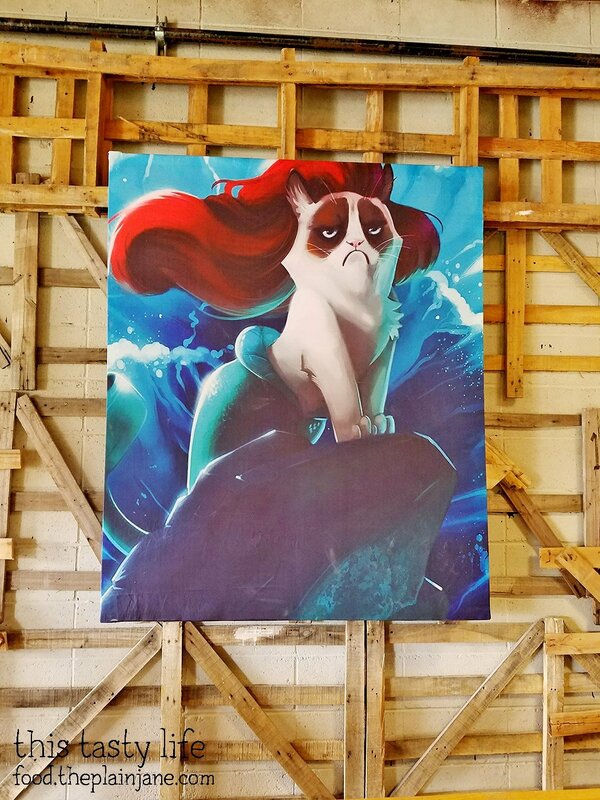 I want that grump cat Ariel painting. I want to put Lifu’s face on there. Hi Faye! Yes, they only offer pretzel bread for their sammywiches. But it’s really good bread! And it’s a good size. Haha, I love the Ariel painting. Lifu would make a great Ariel! Hi Soo – Yes, very tasty! 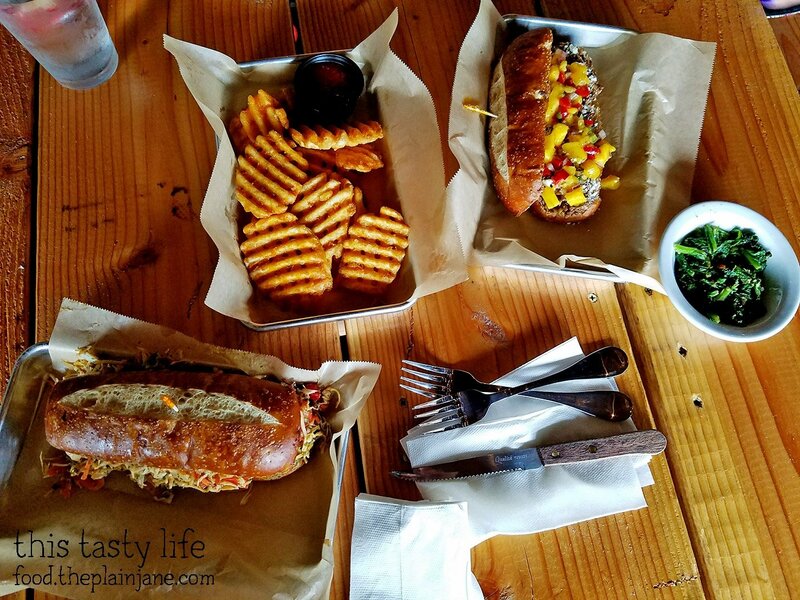 A Road Trip to Scottsdale Awaits You!